HyperSep Glass Block Manifolds are durable, chemically resistant units designed to provide years of trouble-free extractions. Polypropylene racks are highly resistant to chemical degradation and abuse, and are supplied according to the number of positions on the manifold lid. HyperSep solid phase extraction cartridges offer reproducible, reliable sample preparation in a traditional format. Available in a wide range of chemistries and bed weights, the cartridges are ideal for large samples and conform to industry standard configurations, allowing efficient routine processing by vacuum, by positive pressure or centrifugation. 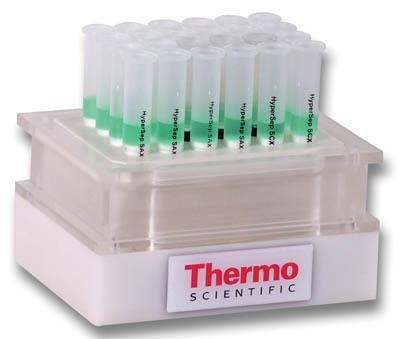 The HyperSep-96 system incorporates traditional solid phase extraction sorbents into 96-well plate format providing fast analysis without sacrificing accuracy or reproducibility. The innovative design of HyperSep-96 well plates provides flexibility for both method development and scale adjustment to 96-well without method revalidation. Well plates are customizable, allowing any arrangement of wells with differing sorbent chemistries for simultaneous processing. HyperSep-96 products are available in packs of 100 individual wells and in pre-assembled plates.